The summer has come and gone, and the school year is already on our doorstep. Paper, crayons, binders, and glue are all going to be high on parents’ shopping lists, but this year we should all focus on more than just school supplies. According to the CDC, more than 18% of our country’s children and adolescents struggle with obesity meaning that what we provide our youth to eat will play a critical role in combatting this disease. The good news is that ChooseMyPlate.gov has tips and tricks for all children and what they could be eating this upcoming school year. Whether your child buys lunch at school or brings a packed meal with them, healthy eating is achievable. 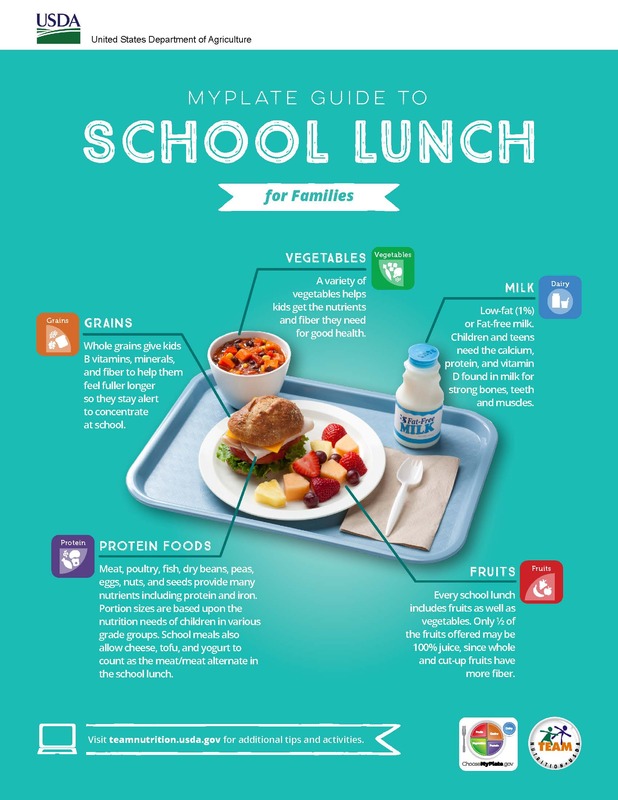 Most schools provide lunch modeled after MyPlate including foods from every food group. These school lunches focus on a variety of fruits and vegetables, whole grains, low fat dairy products, and lean meats. Packing a healthy balanced lunch can be done the same way if your child brings their lunch to school. Being cognizant about avoiding processed, easy to pack/purchase foods is essential. Regardless of which ever option is chosen, one key to each route is accountability. Children should be accountable for making healthy choices and one great way to teach accountability is to commit to being a MyPlate Champion. Being a MyPlate Champion is a pledge by the child that commits them to following MyPlate guidelines such as eating more fruits and vegetables and cutting back on sweets and soda. This is great tool for educators and parents to use to help remind and encourage children to select healthier choices. Click here to take the pledge. Whether in the classroom or at home right after school, snacks are often part of a child’s regular routine. Snacks can be very efficient in providing an extra boost of energy in the day, but they also present an opportunity to either consume empty calories or nutritious foods that helps your body. The healthiest of snacks include items from three different food groups such as celery sticks with peanut butter and raisins. Having at least three different food groups helps provide a wide array of nutritional needs our kids have. Including three different food groups can be a challenge at times, especially because of convenience, so ChooseMyPlate.gov has provided a parent tip sheet that helps give ideas on how to keep snacks creative, nutritious, and convenient. Making a snack healthy is as simple as swapping out the chips for a piece of fruit. Starting a new school year should be like starting a calendar year: everyone should make a New Year’s resolution for the school year. This school year’s resolution should be doing our best to follow and live up to the MyPlate guidelines. If we could manage to complete this goal, we would all be amazed at the benefits the youth would reap not only nutritionally, but in the rest of their lives as well.